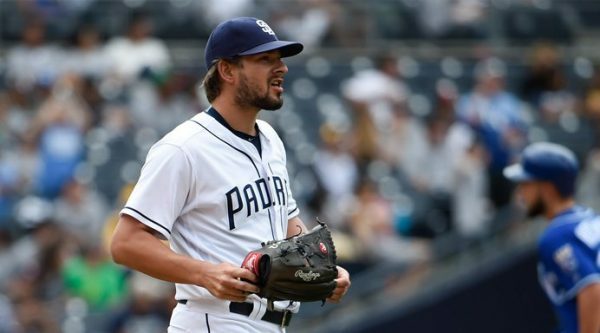 The San Diego Padres aren’t trying to force a Brad Hand trade, but they’re certainly testing the waters. Considering how much it would take to acquire him, it makes sense that the Los Angeles Dodgers, St. Louis Cardinals, Houston Astros and the Milwaukee Brewers will be on top of the shortlist of teams the Padres can work something out with. The Padres aren’t going to contend once again in 2018, so a healthy dose of young prospects for a team that’s in no rush to get anywhere makes sense. Hand is a terrific reliever that any team in the majors would want, especially as a lefty. He’s also not a rental, controllable through arbitration. His projected salary for next season is under $4 million, making him quite a catch. Considering the prospect pool around the majors and eliminating the teams thinking about winning a title, it leaves the four franchises mentioned above. The Dodgers always seem like the complete package, but a better bullpen, and especially someone who can help out Kenley Jansen, would be a welcome addition. The Astros need a lefty reliever in their pen, and have a deep farm system to use for a trade like this. The Brewers have a terrific rotation, but the best way to keep it that way is by protecting it with an outstanding, deep bullpen, and Milwaukee have the young talent to pull something like this off. The Cardinals are also in the picture, especially when you consider the slew of young outfield talent they have, and the moves they’re planning on making this offseason which include trading away some of those players. And of the four teams mentioned, the Cardinals need a closer the most. Hand, 27, didn’t do anything impressive during his first 5 seasons in the league, playing for the Marlins. However, in San Diego, he has been fantastic in 2016 and 2017, posting a 2.56 ERA through 168.2 innings of work. He struck out 11.5 batters per 9 innings and has a 3.83 K/BB ratio. He also made the All-Star game for the first time in 2017.